Our facilities are situated in all of major destinations of choice for the world’s largest and most powerful companies, internet providers and corporate networks. We operate ultra-fast Trans-Atlantic fiber-channels connecting our clients to all the major internet exchanges and global financial centers. IP Transit is a service provides high-speed, highly resilient broadband full BGP Internet table for ISPs, ASPs, CPs, telecoms and data center operators and corporates. CenturyLink partnership helps us to achieve ultimate connectivity both via HSIP and directly via peering partners, establishing sessions that bypass other autonomous systems. We have established over 1500 BGP sessions and are exchanging traffic with over 1000 Tier2 and Tier1 ISPs that actually provide over 350 000 prefixes, and affectively over 80% of traffic is going via peering links. Detailed information can be obtained via Looking Glass and from PeeringDB. Internet routes in full BGP with high speed and high resistance bandwidth for Internet Service Providers, Telecommunications Operators and Data Centers, Applied Service Provider (ASP), and other companies. The partnership with CenturyLink helps us achieve maximum connectivity through both High Speed ​​IP Services (HSIP) and directly through partners, establishing sessions that bypass other autonomous systems. 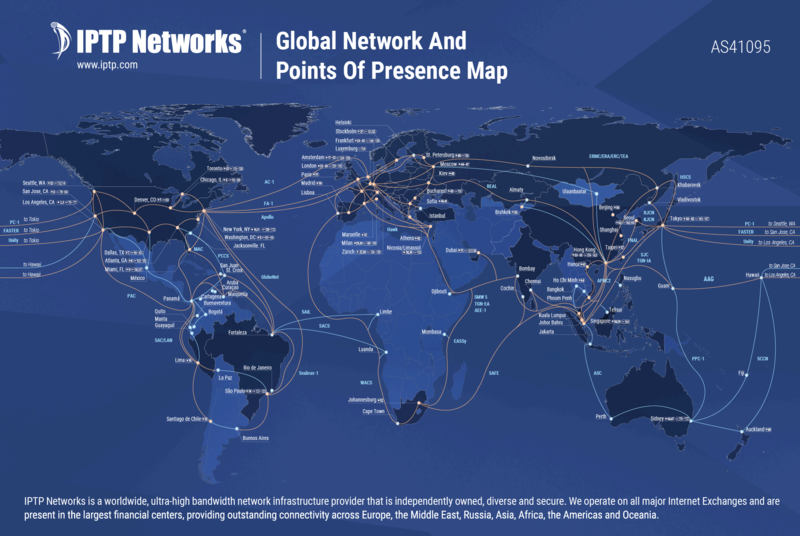 Extensive direct interconnections and well-established bilateral connections with numerous suppliers around the world allow for load balancing, route optimization and excellent global and regional coverage. There are no third parties involved.